78’ - Loyd earns a FK off a Martins foul just outside the box. 80’ - Holy what! Hedges dives in the box, and while the stadium complains a shot whistles over the bar. WHOA GAME. WHOA. 83’ - Blas Perez snags a seat in the LiveSounders Queso Club™ for a hack on Friberg. Welcome. 84’ - Double sub for FCD: Walker Zimmerman and Tesho Akindele. Kitchen sink, meet wall. 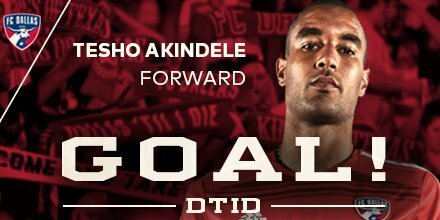 84’ - Goal FCD. Finally hit on one of those crosses. Akindele. The sub. His first touch. 86’ - Have to pour it forward now. A goal and Seattle is still through. 86’ - Chad Barrett snuck into this game like a thief in the night. Need some heroics. Great goal by Dallas, and Seattle has less than 10 minutes to save its season on @FS1 . 88’ - Seattle pushing, and Hollingshead is down. Looks in real pain. FCD is out of subs. 90 + 1 > WALKER!!!!!!!!!!! !